Not much to write about today, other than today I had shin splints. I should have worn the compression sleeves I have for my calves on Saturday. It didn’t help that I wore my barefoot flats to work today–I probably should have worn shoes with a bit more cushioning. Ah well, live and learn. I wanted to go for a walk this evening, but it has rained pretty much all day today so that nixed that idea. Plus I got home later than I wanted to, and now it is getting dark earlier in the day so I will have to either do my walking at work after the kids leave, or find a way to get it done during the day (pretty much impossible). I definitely want to find a way to work more walking in until I can get my rec center membership. Once I get that, then I can walk/run on the indoor walking track there no matter how wet or cold it is outside. Today’s eating was pretty good: I got in 101 grams of protein, and 30 grams of fat. I got really hungry a little while ago, so I had a bit of turkey jerky and that seems to have taken care of my hunger. My afternoon snack today was half an Isopure, which I forgot to include in my collage, so of course it passed right on through my sleeve since it’s a liquid. I’ll probably have more or less the same things for my meals tomorrow that I did today, with the exception of dinner. 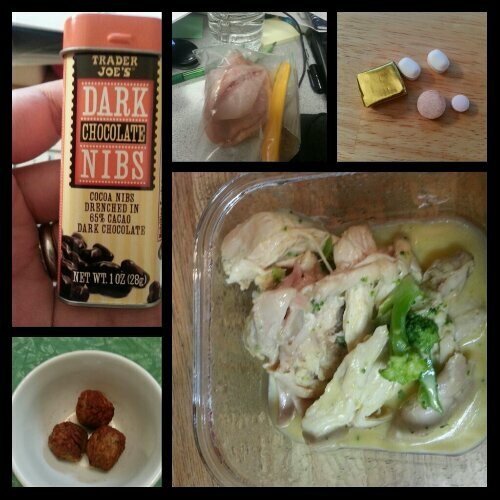 Today’s food choices, from upper left: multivitamin and calcium supplements x2, iron and B12 supplement; cheesy chicken and broccoli; Trader Joe’s turkey meatballs; Trader Joe’s dark chocolate nibs; Boar’s Head Virginia Ham and Sargento reduced fat cheese stick. Not shown: turkey jerky, mini lasagna and green beans. This entry was posted in daily bites, eating, exercise, post-op, vsg, weight loss surgery and tagged aspiring runner, daily bites, eating, exercise, post-op eating, post-op life, runner wannabe, VSG, vsg realness, WLS. Bookmark the permalink.